There was no link, no context. I don’t have the courage to repeat my flip reply. I engaged in name calling. I meant what I said. But I’ll leave it at that. Essentially, a Sherpa made it to the summit and left a wallet with cryptocurrency to be found by some else with the interest and resources to go climb the mountain to go get it. What was this supposed to do? Cause a mad dash of money-grabbing, possibly inexperienced climbers to buy a ticket, hire a guide, and wait for the weather window? Was this the mountain version of the 1965 movie The Great Race? ASKfm left $50,000 in digital funds in its wallet at the top. Considering an attempt costs about $40,000, there’s not much of a margin to make. The worst part, and probably the only reason this story crossed my path when it did, Fox News and other media outlets, was the irony that one of its team members, Lam Babu Sherpa, who allegedly was left behind on the descent, was missing, and later determined to be dead. And ASKfm’s news release about the stunt omits this. Any death on any climb can’t go unacknowledged. Despite some ideas to the contrary, it is extremely rare for a climber to accept the risk of death as a possible outcome so absolute fashion to be nonchalant about it. This event taints the story. It also bugs me that the advertisers, and the climbers burying the wallet on the summit, didn’t treat the death differently. It should have canceled the publicity. I like climbing, but the general climbing news from Everest is rarely worthwhile these days. It also ruins or suppresses the better stories about climbing, including climbing Everest. The trees rose from a cushion of pine needles to great heights with silence, except for a gentle rustling of branches through refracted rays of sunlight. Mount Mansfield and Spruce Peak, with their ski trails — with once the highest aerial tram in the world — rose from this valley, but none of this could be seen or sensed through the woods. When we left our Subaru in the trailhead parking lot, we were in his territory. I walked with one trekking pole while little Wunderkind walked with the other. Schnickelfritz was riding in the kid carrier on my back. Their mother and grandparents understood the significance of these woods here in Stowe, Vermont — the reason we came — but I had to tell the story of its namesake with a little more color for Wunderkind and Schnickelfritz. The Stowe Land Trust owns the 79 acres that makes up Wiessner Woods, which is the only permanent memorial to Fritz Wiessner. While there were many stories to share, the one Wunderkind and Schnickelfritz had to know was from K2 on July 19, 1939. It was late in the day. Wiessner had climbed up above 26,000 feet (roughly 8,000 meters) on second-highest mountain in the world, which was 28,251 feet (8,611 meters) tall, with Pasang Lama without supplemental oxygen. They were alone; they had no radio or way of communicating down the peak to their teammates. They climbed up steep, black rock and were nearly to a point where the rock stopped and it was merely snow all the way to the top, at about 27,500 (8,382 meters). Wiessner was on the cusp to be the first person to climb K2. Except it was getting dark and Pasang was scared; he believed evils spirits dwelt on the summit at night. “No, Sahib,” Pasang said to Wiessner. With his partner unwilling or unable to go, Wiessner turned around with Pasang. Sadly, while Wiessner intended to return, he never would. His high point would stand for 15 years, until Achille Compagnoni and Lino Lacedelli became the first people to stand atop K2 in 1954. But Wiessner’s and Pasang’s record for reaching so high on K2 without supplemental oxygen would stand for nearly 40 years, when Louis Reichardt and John Roskelley climbed the mountain without supplemental oxygen in 1978 in only the mountains third ascent to date. Since then, my kids set up the tent and grabbed their toy hammers as pseudo ice axes to pretend they are climbing K2. Wouldn’t you? The forested cushion of pine needles that make the floor of the Wiessner Woods doesn’t actually stop at its edges. The same woods rolls onto an adjacent 26-acre hillside where a rustic post-modern ski lodge called the Stowehof commands views of Mount Mansfield. It has a German-Austrian alpine flair at its core, that is best celebrated with it’s recently renamed bar. Fritz Bar is cozy and has private corners and tables to make an evening intimate. It is also decorated with photos of Fritz Wiessner, with his hairless head and broad smile, surrounded by mountains and adorned with thick hemp ropes. I dropped in after our visit to the Wiessner Woods to buy Natalie, her parents, and I a round, get the kids a salted pretzel to share, and toast Fritz. Not everyone was always willing to toast Fritz Wiessner, however. Shortly after moving to the United States from Germany in 1929, Wiessner had raised the standard of American climbing at several remarkable North American destinations. In 1938, the American Alpine Club had secured permission to send an expedition to attempt K2 and they’re first choice to lead the team was Wiessner. However, his ski-wax business in Vermont had too many orders to fulfill so he graciously turned them down, and the AAC turned to Charles Houston instead. Houston thought Wiessner’s decline had dubious intent almost immediately; why would he turn down K2? Both Houston and Wiessner knew that the AAC had a permits to attempt K2 for two years, so if Houston’s team failed to make the top, Wiessner could learn from Houston’s mistakes and get the glory. Although The New York Times celebrated the team’s high mark of 26,000 feet (roughly 8,000 meters), Houston was bitter. Not to get too far along into Houston’s life story, this illustrates how much ownership he claimed to K2’s first ascent: The year after his second attempt, and the year before he was to use his permit for an attempt in 1955, Houston briefly went missing and suffered from global amnesia after hearing the news that the Italians finally climbed K2. The sad story that came out of Wiessner’s 1939 expedition was bad news for Wiessner and overshadowed all of Wiessner’s other accomplishments. While Wiessner and Pasang made it to 27,500 feet, Dudley Wolfe, the expedition’s primary financier was languishing and dying at Camp VII. With the exception of Wiessner, the 1939 team was by far a weakest group that climbed high on any Himalayan peak prior to the HImalaya’s Golden Age in the 1950s and 1960s. Wolfe was an enthusiastic, though inexperienced, adventurer. Wiessner knew this, and despite this, he sincerely wanted to help Wolfe to the top. Except, Wolfe’s inexperience, lack of fitness, and the overriding effects of altitude took it’s toll. Critics blamed Wiessner both generally as leader and specifically for allowing Wolfe to climb and stay so high for so long, and finally not for returning for him (though the risks were significant, and his condition was too far gone.) Combine anti-German sentiment that festered during the years during and after World War II, Wiessner’s reputation was tarnished, and in some circles, his wrongdoings were exaggerated into shameless smears. In the 1930s we were just beginning to understand the devastating effects of prolonged exposure to high altitude on the human body. No one had ever stayed in a high camp so long as Dudley Wolfe had before. Wolfe could climb up well enough with help, but descending the steep grade was a bit more technical. Wiessner, by contrast, raced up and down the mountain and in between camps, in a valiant effort to position his team to reach the top. Both men wanted to reach the summit, and Fritz probably, foolishly yet earnestly, promised it to him. Despite the tragedy of the 1939 expedition, I sat down to toast Fritz. And I remembered Dudley Wolfe too. Wiessner was born in Dresden, Germany in 1901. After an impressive climbing career in Europe, Wiessner left Germany for the United States in 1929 for the chance to improve his beyond what Dresden and Germany offered. He quickly demonstrated that his climbing skills were beyond what had ever been attempted by Americans, making a similar impact to what Austrian-immigrant Conrad Kain had in Canada. Climbing the mysterious Mount Waddington, in the Coast Range of British Columbia, Canada. It’s not easy to judge other people’s climbs, but I’d venture to say that nothing of comparable difficulty at such an altitude would be performed by anybody during the next nineteen years, until Walter Bonatti and Carlo Mauri’s brilliant first ascent of Gasherbrum IV in 1958. Wiessner, and Wolfe behind him, was the only one who still wanted to climb the mountain… [T]his leads me to appreciate Wiessner the more. He had the guts — and there is no single thing finer in a climber, or in a man. Wiessner passed away at his home in Stowe, Vermont in July 1988. While his moments on K2 were what everyone reads about, he lead a life where he shared climbing with others, particularly younger climbers, and had the enduring respect of his community. The blemishes from the turmoil of aftermath of the 1939 expedition are hard to forget, but Wiessner remains a constant light and joyful in what the mountains and climbing could bring. Perhaps Wiessner deserves more than a woods and a bar. When I stand in the Wiessner Woods, with the scent of pine always in the air, I feel much farther from the bustling ski resort at Mount Mansfield or event the sheik Stowehof. Maybe that’s why he liked it there. While Wiessner had climbed major alpine peaks, and discovered landmark crags, like the Shawangunks outside New Paltz, New York, his favorite places were in Stowe and in a tiny corner of the Adirondacks that I touch on in this blog periodically: Wallface. Wiessner preferred going to and climbing at Wallface not because it was big, though it’s respectable in scale, not because it is firm because it’s a little chossy, but because it’s a long way from the road. It’s quiet. It’s rarely visited. Wiessner never let the 1939 K2 expedition detract from his life, or hold him back from what he sought to do next. He lived his life. He had his children and grand children. He ran his business. He shared climbing with others. And he retreated for a respite, now and then, to the woods of Vermont, and sometimes making the long trek to Wallface. References: 1) Jennifer Jordan, The Last Man on the Mountain: The Death of An American Adventurer on K2 (New York: W.W. Norton & Company, Inc., 2010), 188-191. 2) Ed Viesturs with David Roberts, K2: Life and Death on the World’s Most Dangerous Mountain (New York: Broadway Books, 2009), 151-153, 174-177. 3) Don Mellor, American Rock: Region, Rock, and Culture in American Climbing (Woodstock, Vermont: Countryman Press, 2001), 68-69. Here is what is on my bedstand for March 2018. I usually complain that there is never enough time to do everything. I said such things when I worked in Washington, DC and I am saying this in Lancaster, PA too. However, it took moving to Pennsylvania to truly realize that with all of my interests and ambitions, time is my most valuable commodity. Which brought me to ask myself, What is worth my time? Keeping up with work is important (I enjoy it too, which helps immensely,) and spending time with Natalie, Wunderkind and Schnicklefritz is even more valuable to me. Reading and keeping this blog up, both of which bring me great joy. And so is getting outside on trails, or just and taking in nature in some way, even like through a snow day, like yesterday. The Ascent of Rum Doodle by W.E. Bowman (1956) — I thought starting with a satire for a chuckle now and then was a good idea. Bowman’s classic certainly does the trick. It particularly helps if you have read any official expedition books, like Tillman’s The Ascent of Nanda Devi from the first half or so of the twentieth century; Annapurna, while French, might be the most widely read example. From the characters names to absurdity of the nation of porters required to carry equipment of base camp, it’s like one big inside climbing joke. I took this out through the Henry S. Hall Jr. American Alpine Club Library. The Mountains of My Life by Walter Bonatti (originally published in 1998) — As I said before, Walter Bonatti is one of the greatest climbers of all time. This book I have looked at and read snippets of, but never from beginning to end. So the experience will start next week after I finish rereading Rum Doodle. Robert Marshall translates Bonatti’s words for us, but it is Bonatti himself that recounts his tales of adventure in the Alps, K2, and (what I am particularly interested in) Patagonia. Alpinist issue 61 — This issue celebrates “Indomitable” Fred Beckey, who passed away last October. Brad Rassler points out that everyone has a story about Beckey, seemingly because we all want to be a part of him. It’s true, even I have one. Also, Eileen Guo takes us mountaineering in Afghanistan, including with a manless climbing school. 50 Hikes in Central Pennsylvania 4th Ed. by Tom Thwaites (2001) — Natalie gave this to me for Christmas, among some other gifts, to help us navigate the new landscape around us. We discovered that there is much more to offer in Pennsylvania where we now live in Lancaster County than we even thought when we decided to take a new job and move. In fact, within a 30-minute drive we have a great bouldering destination (and I don’t mean Spooky Nook or RecROC gyms) and a world-class destination for bird watching at Middle Creek Wildlife Management Area. I think balancing work, my reading ambitions, and family fun with some outdoors time, will pay loads of dividends. Thanks again for stopping by. 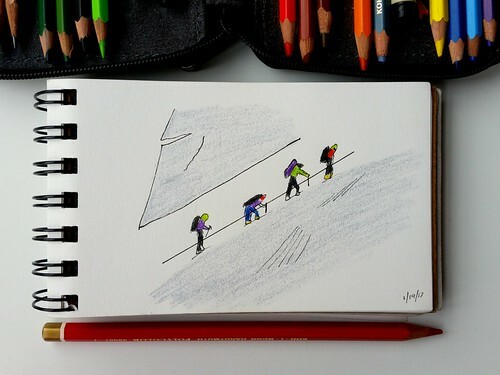 If you enjoyed this post, you might enjoy receiving my monthly newsletter with more climbing history, news on upcoming books, and climbing art by some talented artists. I recently read an article about how expectations can kill relationships — any relationship. For instance, for someone that hasn’t gone backpacking before but wants a romantic stroll into the outdoors to see beauty and feel refreshed might be jolted by the hard work and occasional bad weather. The article recommended that we let observation dictate our vision and judgment rather than our expectations. It’s a little different than just “going with the flow,” because its the essence of adventure; mystery. Don’t try to set expectations, rather let the world tell you the story it has and accept and embrace it for what it is, whatever it is. This makes me think of Steve Hackett’s great adventure. In 1976, he set off alone to the remote Brooks Range in Alaska’s far north. His objective was Mount Igikpak. It wasn’t grand like Mount Huntington or the Matterhorn; in fact most of the images I’ve seen of it make it look worthy of being overlooked. It had been climbed twice before in no distinctive style; first by a team lead by David Roberts in 1968. Hackett had a bold vision. Hackett traveled solo by inflatable kayak and on foot to the peak. He went alone, without support, and no bush planes and before helicopters were popular. The summit pyramid presented overhangs on every flank. His limited protection gear forced him to rely on old gear from the previous ascents, which could easily have been deemed stupid or reason to turn around to many other climbers. Despite the danger, he was bold, considered the risk, and went for it, and stood on top. After returning to the base, he waited for friends to travel together. They never came. He got his inflatable kayak back out and paddled 365 miles in under eight days down the Noatik River. Where would Hackett have been had he not adapted to the challenges and only allowed expectations to get in his way? I am now entrenched in a suburban neighborhood. I bought a house, a second car, a lawn mower, changed the home’s flooring, and painted the bedrooms. I had never considered living in Lancaster County until the job came along. It’s more than an Amish, rural, or a tourist destination. It is a beautiful diverse community with hard-working farms, hills, and wonderful neighbors. But it’s also one of Pennsylvania’s most urban counties outside of Pittsburgh and Philadelphia. And Lancaster County currently hosts two climbing gyms — Lititz recROC and the gym at the Spooky Nook Sports complex. I feel closer to the earth here, the way I do when I visit Vermont. The small farms in Vermont give visitors intimate access to their work, but also reinforced Aldo Leopold’s notion of community where it’s more than just institutions and people, but land and wildlife too. My boxes of climbing books, magazines, and maps are all back together. The contents are all on a shelf, though a little disorganized at the moment. I’ve realized that I need those books, not just the Internet, to write this blog. As much as I want to believe reading is reading wherever you find it, my attention to a nuanced story about a climb or a personal struggle can’t be interrupted by text messages or news alerts. My new piece of advice for any reader, if you’re going to read, set aside some time devoted to reading and reading alone. Personally, I like to read after the kids go to sleep and reading in the same room as Natalie in our new home. I think with things settling down and coming together, the monthly newsletter will finally get off the ground and into your inboxes. Thanks to everyone who have subscribed — and wow, there are a lot of you — you won’t be disappointed. The writer, Rachel Nuwer, told the story of three climbers that attempted to climb Everest but never made it down. They’re tragic stories. The stories she doesn’t tell are tragic too. But as Robert MacFarlane wrote in Mountains of the Mind (2003), “What makes mountain-going peculiar among leisure activities is that it demands of some of its participants that they die.” By comparison, it wouldn’t be tragic for a baseball player to die sliding into third base; it would be singularly unique and virtually unthinkable. While Nuwer introduces some new knowledge and shares some short biographies, she doesn’t provide a complete picture of why there are so many climbers lost and still high on the mountain. It’s complex, but I think the understanding all of reasons and factors in play are important for understanding why they’re landmarks, why the bodies remain in place and do not have a more respectable burial, and that nature of climbing on Everest today. On most mountains, if a climbing partner or a member of an expedition dies during a climb, they’re partners and teammates make every attempt to bring the body home or at least down to the valley. In some cases this can be impossible, unreasonable, or plain dangerous to the rest of the party. In 1936, Toni Kurz was injured on the Eiger’s infamous north face and his rescuers were unable to reach him due to the length of their ropes. They combined two ropes but Kurz was unable to climb past the knot due to his lack of strength through the injury. He hung on the side of the mountain until much later when a team better equipped and better health was able to recover him. Everest is different than the Eiger, of course. It’s at high altitude, where the air is thin and carrying even one’s backpack is a laboring activity. Climbers are subject to degrees of hypoxia and judgment can be impaired. The ridges on the popular routes are narrow and stumbles are to be avoided. Even then, on the south side at least, carrying a body through the dangerous Khumbu ice fall, where house-sized blocks of ice tip, fall and crush without warning, would risk several more climbers lives. Let’s also contrast Mount Everest to the second-highest mountain in the world, K2. K2 is generally steeper for than Everest’s flanks, and for longer stretches. When a climber dies on K2 and is stranded, without the reasonable ability to recover their partner, the fallen climber is left to the effects of the mountain. Most of the climbing on K2 is on it’s face — a giant sloped wall. K2 avalanches sweep it clean of loose debris, which is why even the remains of Dudley Wolfe, who was died on K2 in 1939 were found years later by author Jennifer Jordan on the Baltoro Glacier at the base of the mountain. Everest isn’t as steep and has many more “pockets” for the things it moves. But along the major routes that most climbers attempting Everest take, the path is usually along ridges, less prone to avalanching. When a climber cannot go on, he or she usually settles into a personal pocket of snow drift or under a rock, in a storm to deal with their frostbite, edema, and/or fatigue to wait. Many climbers are displaced, but not usually swept away. And more often, exposed to the high altitude sun rays, and constant freezing and thawing, the remains become semi-permanent in the landscape. Everest has become a popular stop for the tour-bus equivalent of climbers, the commercial expedition. Today, you can pay a guide to handle the food preparation, most of your technical gear, and expedition fees paid to Nepal or China (depending on the side of the mountain you’re climbing). Hand over $40 – $50 thousand dollars and you’re set. You just train (because, as they’ll tell you, you cannot train enough for this mountain), and they’ll make you a path up the mountain. K2 by comparison, has a growing expedition “bus” visiting, but it hasn’t had a boom of business the way Everest has since the 1990s. This has made climbing the world’s tallest mountain — the third pole — very accessible to interested adventurers. This is also another reason why so many have perished, in my opinion. While not everyone that climbs is an amateur, this commercial approach to climbing the mountain sets up different expectations of what is expected (making the summit is often one of them.) I genuinely hope things change so that the next climbers don’t become permanent hosts. Like MacFarlane pointed out, death is part of the deal. But death is always part of the deal. There are more bicycling deaths every year than climbing accidents (400-600:30). So wear your helmet. I am a pedestrian most of the week, so I’m totally cautious crossing the street. Roberts and other climbers usually avoid the topic of death. I think we need to understand it better. It’s not something to gawk at. It’s something real. It happens to loved ones. It happens on Everest, K2, the Eiger, the Adirondacks, and all around us. I think in puzzling over it, we can understand our draw to climbing and the mystery of things that excite us.